One of our greatest fears is being diagnosed with cancer. There are few diseases where the treatment inflicts such massive mutilation, toxicity, lethargy and pain. Once cancer is discovered, a person's life is often never the same. Unlike charlatans who sell worthless products to terminal cancer victims, nutritionist Joe Di Stefano, Daniel Mayer, DO and Ivan Danhoff, MD, PhD seemed to be doing everything right. They had discovered a non-toxic therapy that appeared to be prolonging survival time. Joe Di Stefano, Drs. Mayer and Danhoff were attempting to file the cumbersome paperwork with the FDA in order to conduct a formal clinical study. They did not advertise or promote their product, nor did they promise any miracles. They charged $1,200.00 for as many intravenous treatments that a patient needed to achieve a remission or complete response. If a cancer patient could not afford the $1,200.00, the therapy was provided for free. No one was denied this therapy based on inability to pay. According to the FDA, none of the above was permissible. The FDA has taken particularly brutal steps to make sure that no cancer patient can access this therapy. The FDA now wants to criminally indict those involved so that this therapy will never be available. Nutritionist Joe Di Stefano seemed to be doing everything right. He had discovered a non-toxic therapy that appeared to be prolonging survival time. In early October, 2001, Joe Di Stefano exited his medical clinic at midnight after a long day's work, and was startled to hear strange noises coming from the dumpster in the back. Trash was strewn all over the ground. He peered over the top of the dumpster and caught two strangers red handed, with rubber gloves on, probing through his dumpster, trespassing on his property without a search warrant. Then he noticed their unmarked car nearby. Obviously they just assumed no one was there late at night. "Sure you are," said Joe, "everyone looks for boxes at midnight in a dumpster with rubber gloves on." Joe proceeded to write down their license number in order to file a complaint with the St. Petersburg police. He demanded that they put the trash back in the dumpster, which they only grudgingly did, before peeling out of the driveway with screeching tires, angry at getting caught trespassing. It turned out that these "dumpster divers" were FDA agents seeking evidence to obtain a search warrant against Joe Di Stefano's clinic. 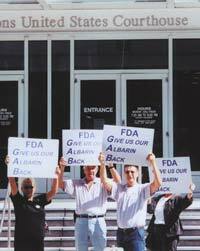 A week later on October 11, 2001, 120 agents from the FDA, DEA, Customs, U.S. Marshall's Service, Florida Department of Law Enforcement and the Hillsborough County Sheriff's Office raided Joe DiStafano and Dr. Mayer's clinics in Tampa and St. Petersburg, Florida. The home of Joe DiStefano was also raided. Joe's personal property, including his children's computers that they needed to do their schoolwork, was seized as the agents made disparaging and insulting comments to DiStefano and his wife, Georgeann. When the FDA agents attacked the clinics, patients were being administered various therapies by IV injection. The law enforcement officials asked the patients if they wanted to be unhooked from their IVs, but not a single one said yes. "We're all adults here making free will choices. Why don't you get out of here and leave us alone?" "This will be your last treatment!" Schebell slumped in his chair. A nurse worried that he might be having a heart attack tried to go across the room to comfort him, but the FDA agent stood in her path. She pushed past him and went over to Schebell, who felt like he'd just been issued a death sentence. A simultaneous raid occurred against Ivan Danhoff, MD, PhD of Grand Prairie, Texas, the solidly credentialed researcher and author of the book, Remarkable Aloe: Aloe Through the Ages. Dr. Danhoff has published more than 80 research papers, and has served as a consultant to several pharmaceutical research institutes. He has been a consultant to the FDA, serving on review panels and committees dealing primarily with gastrointestinal drugs. After more than 20 years of research, Danhof developed an intravenous aloe vera preparation called Albarin. It is this special aloe extract that was being used so successfully at the Florida clinics. The compounding pharmacist who prepared the aloe extract (Jerry W. Jackson of Allied Pharmacy Services, Arlington, TX) was also raided. Seized in the raids were the aloe extract (Albarin), all patients' charts, along with all computers and other business records. The purpose of the Oct 11, 2001 FDA raid was to stop cancer patients from being able to use this intravenous form of aloe vera (called Albarin). It is difficult for us to verify this efficacy data, because the FDA seized all patient records. These cancer patients' lives now have been thrown into disarray; eight have died as we go to press. Clearly, the surviving cancer patients must get their Albarin back. If the FDA succeeds in this draconian effort to suppress patients' access to Albarin, it will have a chilling effect against other medical pioneers and suppress consumer access to potentially life-saving therapies. While the FDA attempts to build a criminal case against those involved in this project, many more patients face near certain death. A video made after the FDA raids shows actual cancer patients describing how Albarin was responsible for keeping them alive. At the end of this article, you will find out how you can obtain this video by making a small contribution to the legal defense fund. The government is not committing full resources to fight terrorism! demanding that the FDA return the seized aloe (Albarin) extract. Ironically, these multiple FDA raids came exactly one month after the terrorist attacks on the World Trade Center/Pentagon. If you watched TV on October 11, 2001, you heard elected and appointed Federal officials categorically state that all law enforcement resources were being used to fight terrorism, specifically the spreading anthrax endemic. You heard officials at the highest levels of government proclaim that the United States was at war both at home and abroad and that State and Federal government were totally committed to protecting American lives and winning the war against terrorism. The government was not telling the truth! At the very time that anthrax was contaminating congressional office buildings, the FDA was expending resources digging through Joe Di Stefano's garbage and assembling a team of law enforcement personnel to conduct multiple raids. The law enforcement agencies involved in this FDA raid could have been protecting Americans against terrorism. Instead, the FDA thought it was more important to deny terminal cancer patients access to a therapy that may have been keeping them alive. In the next section, you will learn why the FDA is so compelled to censor these types of alternative therapies. Who benefits from FDA "protection"? Most people don't realize how politically influenced the FDA is. Several former FDA officials who now work as consultants for private industry explained this to me. The FDA receives a lot of "complaints" about various products it regulates. "Do you mean a lot of consumers complain to the FDA?" The answer is no. The FDA defines "complaints" as when a commercial company contacts the FDA and asks them to investigate the activities of a competitor. The purpose of these complaints is to cause problems for the competitor so that the "complaining" company can gain a tactical advantage in the marketplace. The FDA is happy to serve various pharmaceutical interests in this role due to the revolving door between the Agency and certain companies whose interests they protect. The FDA claims to be a consumer protection agency. The truth is that industry uses the FDA to attack competitors. So when the FDA pretends to have the interests of consumers at heart, always look to who benefits from the FDA's actions. In most cases, it's giant drug companies, the blood banking industry, large food processors, etc. There is relatively little "consumer protection" provided to the American public by the FDA. The FDA aggressively protects the profit margins of industry (especially big drug companies), at the expense of the individual consumer. Now here is where the story gets interesting. Who do you think "complained" to the FDA about Joe Di Stephano and Dr. Mayer's intravenous aloe therapy? It turns out that no cancer patient or their families ever complained. Joe Di Stefano and Dr. Mayer are loved and respected by their patients who found them by word-of-mouth. Unlike many alternative clinics attacked by the FDA, Joe Di Stefano and Dr. Mayer were not advertising and not making curative health claims. Remember, to find out what motivates the FDA to act, you have to look at whose economic interests were being impacted. It turns out that more and more cancer patients were choosing this nontoxic alternative therapy instead of chemotherapy. So the oncologists in the area got together to "complain" to the FDA about Joe Di Stefano and Dr. Mayer selling an unapproved cancer drug (aloe extract). Realizing that these conventional oncologists are part of the monolithic "cancer industry," the FDA acted with lightning speed to shut down this competitive threat. After all, if the effects of this aloe extract became widely known, it could inhibit sales of highly profitable chemotherapy drugs. The FDA has historically functioned to protect the profits of the politically well connected. Small companies who discover novel approaches to treat disease seldom survive the FDA's delays in approving paperwork or Gestapo-like raids as were instigated against Joe Di Stefano, et al. The FDA is attempting to label Albarin as a "dangerous, unapproved drug" and would have people believe that Joe Di Stefano and others involved with it were "ripping people off." Joe Di Stefano claims they were bending over backwards to comply with the FDA's drug approval process when the raid occurred. If Joe Di Stefano's group had been a large pharmaceutical company, the FDA would have made an inquiry about what was going on instead of conducting an armed raid. The FDA is threatening to bring criminal charges against Joe Di Stephano and others for selling an "unapproved drug." Based on how the FDA traditionally prosecutes a criminal case, they will seek to block all evidence and testimony showing that the unapproved therapy may be effective. Instead, they will make their case to the jury that it is illegal to sell an unapproved drug. FDA enforcement personnel have stated that they don't care whether Albarin was saving people's lives or not. They say their job is to enforce the law, not determine efficacy. The Judge sealed the documents relating to the execution of this search warrant and all the patients' records remain with the FDA. This prevents us from conducting a complete independent evaluation of this situation. However, the medical records that we have reviewed lends weight to the many testimonials from actual cancer patients about the benefits they were obtaining from Albarin. How effective is this aloe extract? We could present an array of evidence that would indicate that Joe Di Stephano's aloe extract (Albarin) is a valid cancer therapy, but we are going to wait until we can get ahold of the actual patient records (now being held by the FDA). We don't want to raise any false hopes. The handful of medical records we've seen seem to confirm the numerous verbal testimonies we've heard regarding Albarin's effectiveness. Although the FDA has made a more complete evaluation impossible until some time in the future, we still emphasize the need to contribute to Joe DiStefano's legal fund and to do everything possible to help these cancer victims get their Albarin back! It is important to point out that studies published in the peer-reviewed scientific literature indicate that aloe extracts may be effective against cancer. The problem is that this special aloe extract (Albarin) cannot be obtained anywhere else at this time. The sad fact is that despite aggressive use of chemotherapy and other conventional treatments, there was little in the way of improvement in long-term survival against most forms of cancer from years 1950 to 1995. This dismal statistic was revealed in a study published in the Journal of the American Medical Association (Welch HG., et al. 2000). The title of this article is, "Are Increasing 5-Year Survival Rates Evidence of Success Against Cancer?" The doctors who authored this study reviewed cancer mortality data from year 1950 to 1995. The purpose of this review was to determine if progress is being made in extending survival time of cancer patients. The results showed that for the most common cancers, the odds of dying in 1995 were about the same as in 1950. The reason more people are now living over five years is because of improved methods of screening and diagnosis, i.e. the cancer is found earlier when it is easier to treat. This grim survival data, published in the American Medical Association's own journal, indicate that more innovative approaches are needed if we are to discover effective methods of treating this dreaded disease. Even after cancer patients are declared terminal, the FDA does everything in its power to deny access to alternative approaches. The FDA's hostile actions directly suppress the kind of creative thinking that is so desperately needed to eradicate this insidious disease. Scientists who have discovered innovative therapies face financial ruin and incarceration if they dare offer them before gaining the FDA's official seal of approval. Scientists have identified many ways of controlling cancer cell propagation, but little of this new technology is being used in the clinical practice of medicine. When a scientific discovery is made, drug companies spend years seeking a patent and then more years carrying it through the bureaucratic approval process. The reason why so many cancer patients continue to die is an antiquated regulatory system that causes potential therapies to be delayed or suppressed altogether. The system needs to be changed if we are to make a realistic attempt to save the 1500 American cancer patients who perish each day. Our long-standing proposal has been to change the law so that anyone can "opt-out" of the FDA's so-called umbrella of "protection." The way this approach would work is that companies could sell novel products with a label clearly stating that they were "Not Approved By The FDA." Consumers who trusted the government could stay with FDA-approved drugs only, while those willing to take a risk would be allowed to try whatever they choose. Companies that made fraudulent claims for products could be prosecuted under the laws that exist today. We believe that this free market initiative would result in a renaissance in the practice of medicine, analogous to the computer technology revolution that has occurred over the past two decades. In this free market environment, many inexpensive cures would be found for lethal diseases. Greater competition would help eliminate the health care cost crisis that exists today. In this libertarian utopia, when you heard about a medical breakthrough on the news, you would not have to wait years before the therapy might become available. Today's over-regulated system results in terminally ill people hearing of scientific discoveries that could cure their disease, but are quickly advised by the newscaster that the therapy is years away from FDA approval. We think that terminally ill people should be able to make up their own minds about what drugs they are willing to try. There are millions of cancer patients alive right now who face possible or probable death in the next 12 months. If you add up family members and friends, there are tens of millions of Americans who should be outraged by an outdated regulatory system that blocks access to potentially life-saving therapies. The reason the FDA can continue to suppress innovative therapies is that cancer patients have failed to organize for the purpose of abolishing the FDA's arbitrary authority. The first step to changing today's outmoded system is to organize those who understand the magnitude of this problem into a group that will make an impact on Congressional leaders. We ask those who are concerned about cancer to register their names and addresses at the website, www.cancervictor.com. You will be kept informed on legislation actions to break down the bureaucratic barriers that deny effective therapies to cancer patients. Joe Di Stefano and the others have run out of money to pay attorneys. 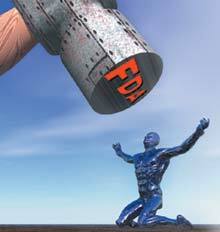 The FDA has economically devastated their business and they are now facing criminal charges. Joe Di Stefano, NC and Daniel Mayer, DO do not have deep pockets, but now have some large legal expenses. They unselfishly devoted themselves to their patients, and were charging next to nothing for the Albarin treatments. For a donation of $25.00 you will be sent a videotape with footage of a protest held by the Albarin patients in front of the Federal Courthouse in Tampa. Included on the tape are numerous interviews with Albarin patients, pleading for your help so that they might live. The video tape will shock you, as you hear multiple testimonials from cancer patients who believe they owe their lives to the pioneers who developed Albarin. As soon as I heard about these outrageous FDA raids, I flew to Tampa and spent two weeks helping Joe Di Stefano organize his legal defense. I spoke with numerous cancer patients and reviewed the results of studies indicating that Albarin was working exceedingly well. Dr. Danhof stated that Albarin is almost identical to Acemannon, an aloe drug patented by Carrington Labs, where Danhof used to work. He explained that the difference is Acemannon uses only the middle part of the leaf, the filet as its called, which has a high water content, so it's more diluted than the extract used in Albarin, which utilizes the whole leaf. This is the only way to get the large molecule constituents that work well in the treatment of cancer. Danhof stated that Acemannon's safety had been verified by numerous animal studies and had been approved by the Department of Agriculture for use in the treatment of feline leukemia and in the treatment of sarcomas, for which it worked very well. Dr. Danhoff stated that Albarin had a history of being used successfully since 1996 in humans in over 600 patients in the USA, Canada, Mexico, Holland, Belgium, Germany and China. He emphasizes that he goes to great lengths in his lab using spectral chromatography and other analytic methods to produce a safe, pure substance, and that he has tested every batch on himself or his colleague first before giving it to any patients. All aloe utilized was certified organic. He emphasizes that it took him over 20 years to perfect the process of producing Albarin, which is extracted through a freeze-drying process. "not a side effect, its just a sign that the immune system is responding favorably, and when you contrast this with the side effects of chemotherapy drugs such as severe nausea, vomiting and other problems stemming from toxicity, which Albarin doesn't have, it's a vast improvement, and a big reason why patients like it so much." 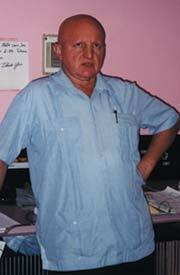 Dr. Danhof provided a statement to me detailing his extensive experience as a medical researcher and professor of medicine at Southwestern Medical School, the University of Texas Health Science Center in Dallas between 1953 and 1983 where he first started studying aloe. You can find out more about Albarin, including several key studies cited by Dr. Danhof, by accessing the International Advocates For Health Freedom website, www.iahf.com - go to the Albarin Raid section. Please send at least a minimum $25.00 donation (more if you possibly can) to the legal defense fund. You will receive the videotape of the patient interviews so you can help save the lives of the cancer victims who appear to have derived significant benefit from this natural therapy. PO Box 625 Floyd, VA 24091 USA 1-800-333-2553. Greenlee RT, et al. Cancer statistics, 2001. CA Cancer J Clin 2001 Jan-Feb;51(1):15-36. Welch HG, et al. Are increasing 5-year survival rates evidence of success against cancer? JAMA 2000 Jun 14;283(22):2975-8. Pecere T, Gazzola MV, Mucignat C, Parolin C, Vecchia FD, Cavaggioni A, Basso G, Diaspro A, Salvato B, Carli M, Palu G.
Department of Histology, Microbiology, and Medical Biotechnologies, Medical School, University of Padova, Italy. Here we report that aloe-emodin (AE), a hydroxyanthraquinone present in Aloe vera leaves, has a specific in vitro and in vivo antineuroectodermal tumor activity. The growth of human neuroectodermal tumors is inhibited in mice with severe combined immunodeficiency without any appreciable toxic effects on the animals. Aloe Vera has been claimed to contain several important therapeutic properties, including anticancer effects. 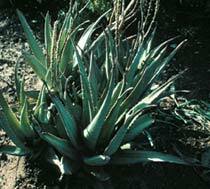 The effect of Aloe Vera administration was studied on a pleural tumor in rat. Growth of Yoshida AH-130 ascite hepatoma cells injected (2 x 10(5) in 0.1 ml) into pleura of male inbred Fisher rats was evaluated at different times (7th and 14th days). Data show that the use of Aloe Vera proved a therapeutic method, and that the present experimental model could be useful in the study of other therapeutics treatments in vivo. Corsi MM, Bertelli AA, Gaja G, Fulgenzi A, Ferrero ME. Institute of General Pathology, Medical Faculty, University of Milan, Italy. Department of Veterinary Pathobiology, Texas A & M University College Station 77843, USA. Acemannan is the name given to the major carbohydrate fraction obtained from the gel of the Aloe vera leaf. It has been claimed to have several important therapeutic properties including acceleration of wound healing, immune stimulation, anti-cancer and anti-viral effects. However, the biological mechanisms of these activities are unclear. Because of this wide diversity of effects, it is believed that they may be exerted through pluripotent effector cells such as macrophages. The effects of acemannan on the mouse macrophage cell line, RAW 264.7 cells were therefore investigated. It was found that acemannan could stimulate macrophage cytokine production, nitric oxide release, surface molecule expression, and cell morphologic changes. The production of the cytokines IL-6 and TNF-alpha were dependent on the dose of acemannan provided. Nitric oxide production, cell morphologic changes and surface antigen expression were increased in response to stimulation by a mixture of acemannan and IFN-gamma. These results suggest that acemannan may function, at least in part, through macrophage activation. antileukemic principle isolated from Rhamnus frangula L.
A systematic fractionation of an ethanol-water (1:1) extract of the seeds of Rhamnus frangula L., guided by assays for tumore-inhibitory activity, led to the isolation of aloe emodin (1). This compound was found to show significant antileukemic activity against the P-388 lymphocytic leukemia in mice. A note-worthy vehicle-dependence of the testing results is reported. In the light of this vehicle-dependence, the re-examination of other anthraquinone derivatives is recommended.